Mitt Can’t Just go Away | Passing Through . . . .
“What the president’s campaign did was focus on certain members of his base coalition, give them extraordinary financial gifts from the government, and then work very aggressively to turn them out to vote, and that strategy worked,” Romney said on a post-election conference call with donors. A better example of an unearned “gift” is being born the son of a wealthy, famous politician. My colleague Kevin Drum has already addressed why Romney’s remarks are ridiculous—political parties reward their constituencies, and Romney would have pursued goodies for GOP backers had he been elected. Financial institutions would have been very happy with a Romney administration that repealed Dodd-Frank, military contractors would have been delighted with Romney’s plan to raise military spending to astronomical levels, and Romney’s wealthy donors would have been delighted with his tax cuts for high earners. These are all “extraordinary financial gifts,” and unlike student loans or health care coverage, they do nothing to help ensure that being born into a family of modest financial means doesn’t prevent a person from succeeding. Help with student loan debt doesn’t mean you didn’t have to work hard to get good grades. A better example of an unearned “gift” is being born the son of a wealthy, famous politician so that you’ll never have to worry about student loan debt. I think Bouie has it right. If Romney is saying “what he thinks a conservative would say,” it’s probably because there are so many conservatives saying it. Rush Limbaugh, whose influence on conservatism dwarfs Romney’s, explained the 2012 election results by saying “People are not going to vote against Santa Claus, especially if the alternative is being your own Santa Claus.” The sentiment was repeated on Fox News incessantly, with on-air personalities like Eric Bolling saying “people voted to continue to get free stuff,” and Bill O’Reilly saying Romney was “right on the money.” This notion is deeply flattering to conservatives who would like to imagine themselves as rugged individualists, and those who disagree with them politically as lazy moochers. As with the 47 percent tape, several conservative intellectuals have rejected Romney’s statements and explained why they were incorrect. In both cases, however, Romney’s problem was not diverging from conservatism so much as expressing it in ugly and unappealing terms. 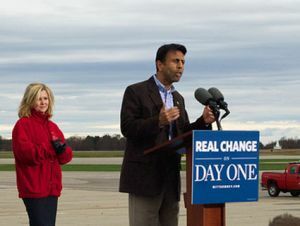 The Republican reaction from party leaders like Jindal is not a rejection of the worldview underlying Romney’s remarks, which is extremely popular in right-wing media. It’s an expression of political opportunism from politicians who want to leave their footprints on Romney’s back as they chase their own ambitions. If it were anything else, you’d see Jindal telling Rush Limbaugh or Fox News, not Romney, to shut up. Republicans Rally for Right Remedy; Regret Rout, Retreat and Recriminate Romney’s Rhetoric.